" Thomas son of Pet^r Dill born . . . . . . . 27. 1. 82"
George Tolman (compiler), Concord, Massachusetts Births, Marriages and Deaths, 1635-1850 (Concord, Mass. 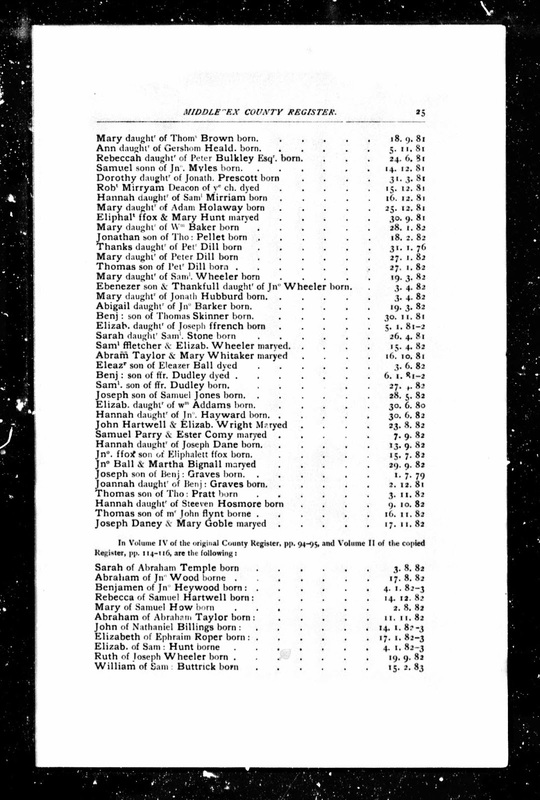 : Committee on Printing, 1894), Middlesex County Register, page 25, Thomas Dill birth entry, 1682. Thomas Dill and his twin Mary Dill were the last two children of the seven born to Peter and Thanks (Shepard) Dill of Concord and Littleton, Massachusetts. He married twice, first to Mary Pierce (1682-1713) in 1706, who bore him three children, and second to Mary Cheney (1695-1735) in 1713, who bore him two children.